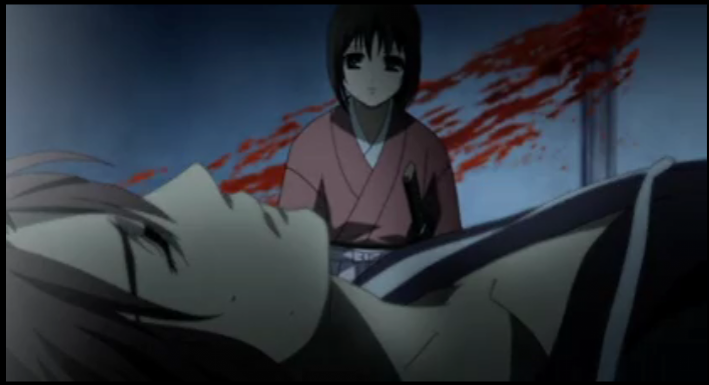 Episode 3 kicks off with the bloody events of the Ikedaya Affair, in which Chizuru plays a spirited, if minor, role. Some mysterious (and powerful) villains appear. The Shinsengumi do not have time to completely recover from sustained injuries as events move towards the rebellion outside the imperial palace’s Hamaguri gate. Warning: this post includes more images than usual, because it was that cool. 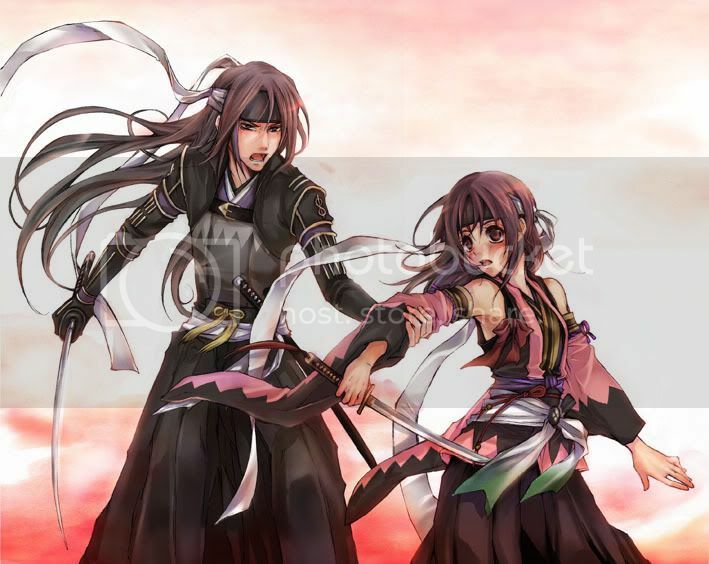 Picking up right where episode 2 left off, July 8th, 1864, a small group of Shinsengumi attack the Choshu, while Chizuru runs to alert the Hijikata’s reinforcements that they are needed at the Ikedaya Inn. 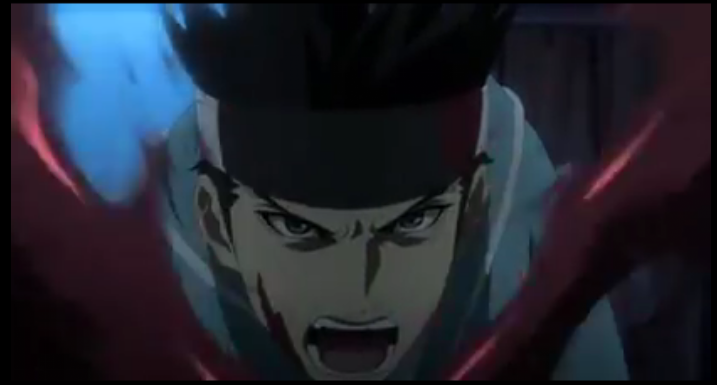 Isami Kondou leads the attack on the Ikedaya Inn. Perhaps surpisingly, the greater part of this episode was dedicated to the Ikedaya Affair, thus making it more action-oriented than the episodes which came before it. 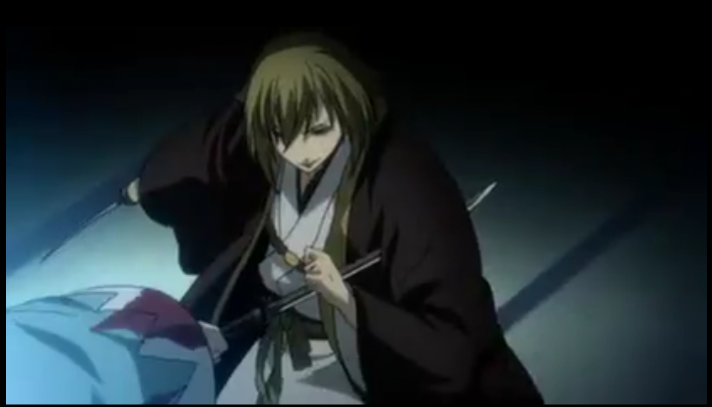 As per historical record, the small group of Shinsengumi fought bravely, with Souji Okita fighting alone on the second floor, but this time we see that the Chushu have been joined by two powerful samurai, who are on the second floor, and one of them almost kills Okita in a nicely animated fight. Meanwhile, thanks to Chizuru, the reinforcements arrive. In an interesting interpretation, Toshizou Hijikata refuses to let the Aizu clan participate in the raid under the pretense that they won’t be recognizable as allies, since they aren’t wearing Shinsengumi colors. In the live-action Shinsengumi Chronicles (1963), the Aizu clan doesn’t show up until the next morning, after the fight is over. 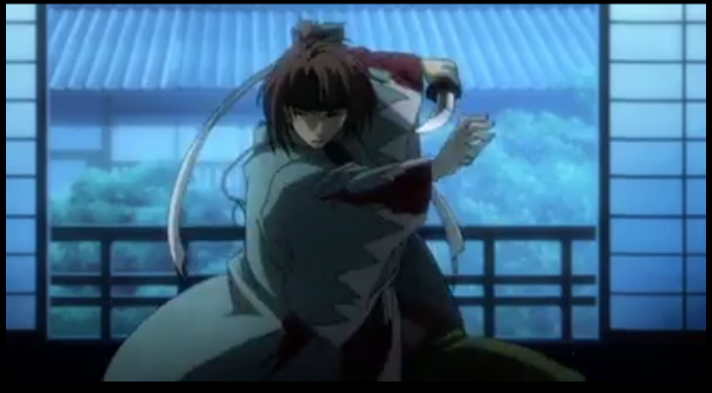 Hijikata refuses to let the Aizu clan claim credit for stopping the Choshu plot. Chizuru isn’t content with her contribution so far. 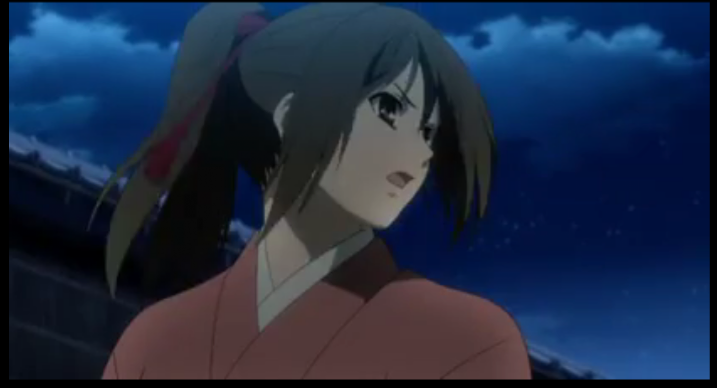 She races into the inn, to assist with wounded Shinsengumi. At Star Crossed Anime, PSgels criticizes her soundly for this, but I’ll give her credit; I think the intention is to show her acting courageously and compassionately, without giving her unrealistic fighting powers. PSgels describes her behavior as “stupid”, and I will agree that it is reckless, although you could say the Shinsengumi attack was reckless as well. 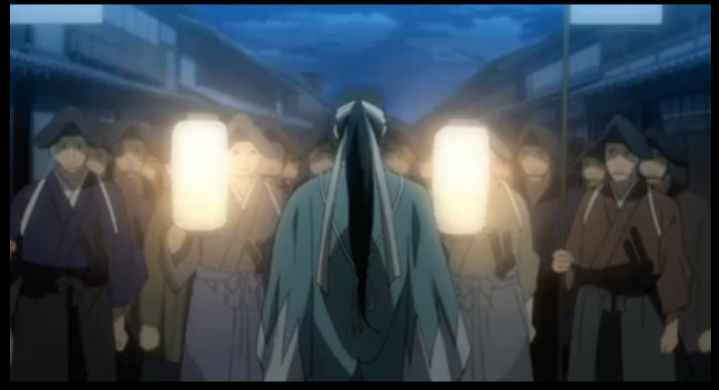 As the Shinsengumi carry their dead and wounded back to their headquarters, and again, later while they are out on patrol, the townsfolk are still shown as fearing them. Given the bloody mess they made of the Ikedaya Inn, that isn’t too shocking, but Chizuru is surprised, since their actions protected the whole of Kyoto. Shinpachi Nagakura explains that the people of Kyoto side with the Choshu, against the Shogunate, whom the Shinsengumi support. 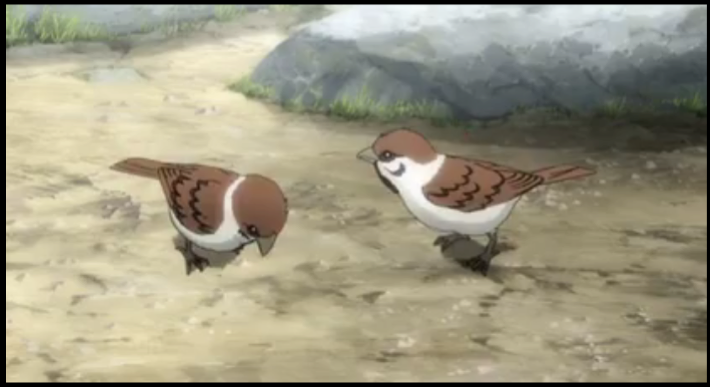 Back at the compound, the Shinsengumi are shown taking some kind of medicine. Is this the medicine they didn’t want to take before? This is followed by a visit to the Gion Matsuri festival. 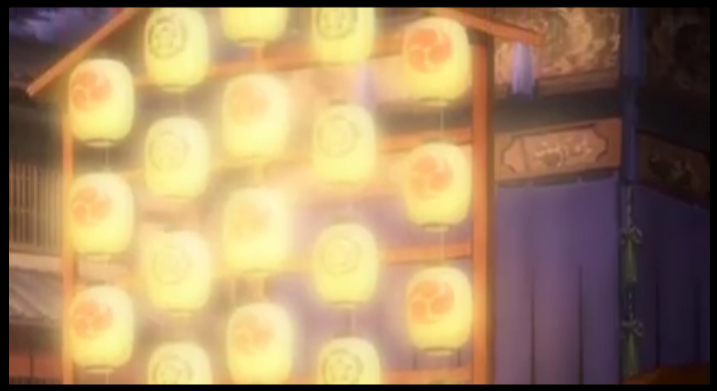 As they observe the festival floats, an orchestra of flute and bells reminds Shinpachi of the beginning of the Tale of Heike, which he quotes, ending in, “The mighty fall at last, they are as dust before the wind.” I thought this part was very nice. I really liked the atmosphere created by the traditional music and the sound of insects. Sannosuke Harada remarks that it is the night before the end of the festival, so at this point it is July 30th (unless he is referring to Yoiyama, making it July 15). 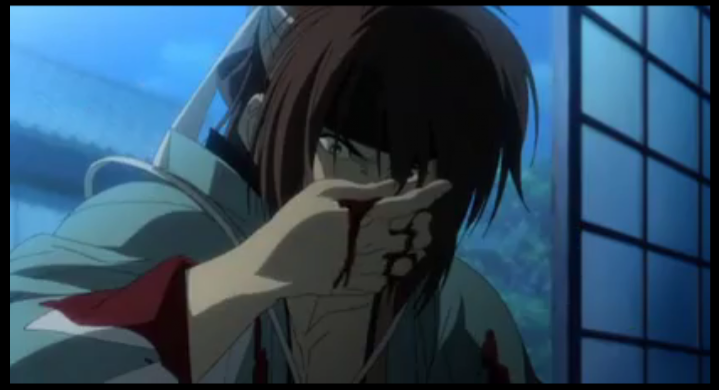 Soon after this, too soon for all of them to have healed, the Shinsengumi are asked to assist in the suppression of a rebellion outside the palace’s Hamaguri gate. 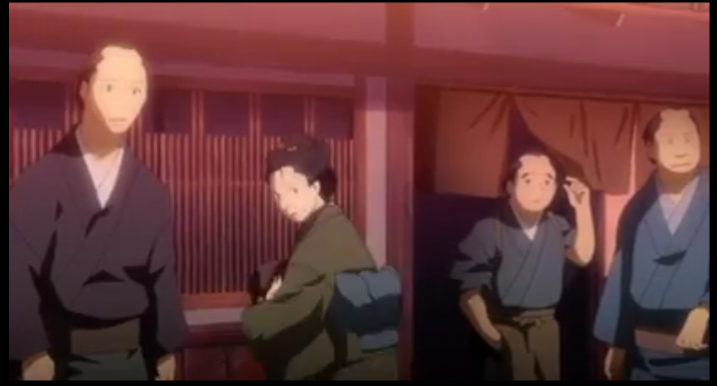 Because of her assistance during the Ikedaya affair, Chizuru is asked to join them as a runner and medical assistant. 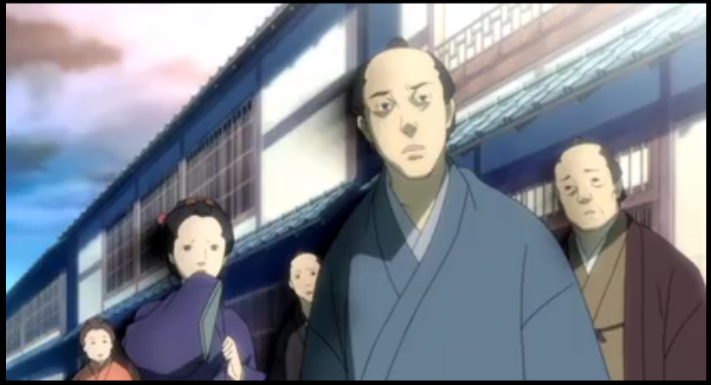 If they truly are marching to the Hamaguri gate, this episode ended on August 20th. Chizuru, the way she acts, is a serious liability.. so I’ll agree with you that the Shinsengumi are acting foolish just by having her tag along.. the whole concept just drags the show down for me. The least they could have done is given her 15 minutes of basic training in not being a total moron. I fully expect the standard training montage in episode 4. Well, I meant attacking the place with only six guys was reckless. According to historical figures there were 30 revolutionaries captured or killed at the Inn that night, not including the Innkeeper and his relatives. So the original Shinsengumi attack, led by Isami Kondo meant they would each have to take down 5 opponents. Given that kind of reckless behavior by her allies, I don’t think it is unrealistic for Chizuru to be warmly regarded by them for having charged into a dangerous situation. 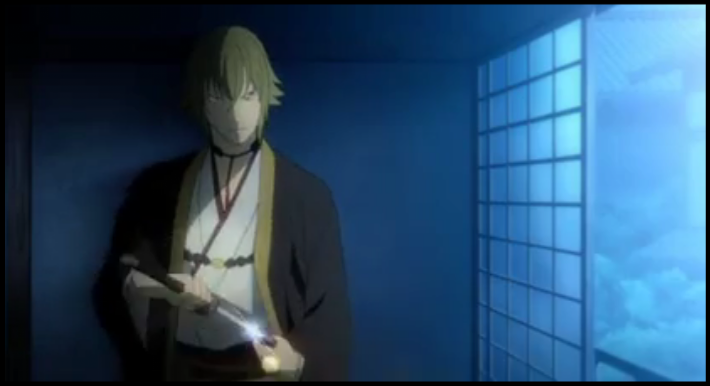 I’m not saying it was smart, but I wouldn’t call the Shinsengumi raid “smart”, either. Desperate, perhaps. Courageous, perhaps. I see what you mean 🙂 I was just saying the same thing, that she’s in the company of people who don’t seem to know what they’re doing and don’t seem to care (much). This episode rekindled my interest in the series even with Chizuru getting in the way at times. I hope that fan art becomes reality and she actually DOES something besides being a messenger. Even if she starts using her sword, I can’t imagine her being good enough with it to fight any of the real villains. At best she would be fighting the C-grade soldiers that never get a name.